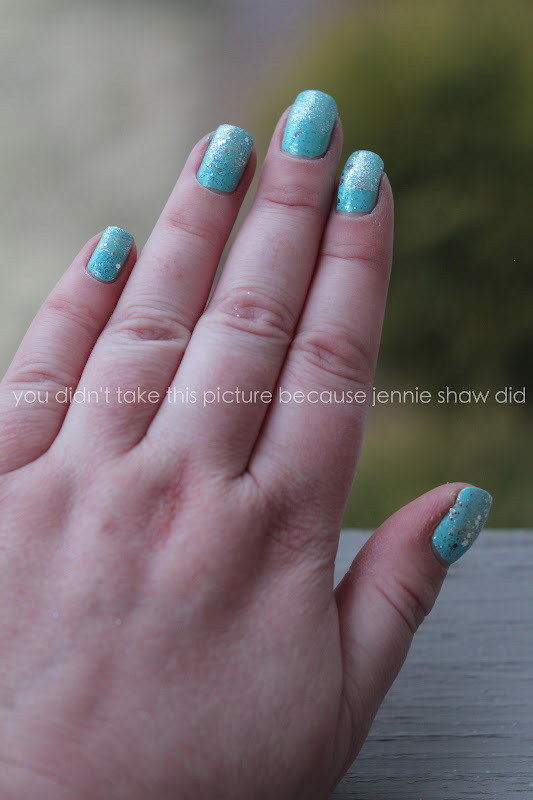 Last week, I noticed that not one but TWO Nail File posts included the prettiest Robin's eggshell blue I've ever seen. It took me two trips to the store but FINALLY, I got myself a bottle of China Glaze's For Audrey and, let me say, I've fallen in love with the colour! It's just so freaking pretty! One of those colours that I know I'll wear all of the time. And it's so perfect for spring! So here's what I used this week. OPI's Crown Me Already, China Glaze's For Audrey, and OPI's Gone Gonzo. I did two coats of For Audrey and then did the top two thirds of my nails with one coat of Crown Me Already. It was missing something, so then I added a small section of Gone Gonzo on the bottoms. It looks like a sparkle-fade and I couldn't love them more! and your nails remind me of easter eggs, haha. Your nails look fab! I am definitely going to need that Audrey color. It is beautiful! I have the Gonzo sparkles and I love them! BEAUTIFUL!!! Love the sparkles! Such a pain to remove though!! seriously love this! why dont my nails ever look awesome like yours?! Great Color combo Girl!! I love that blue it's like a Tiffany's Box! And great idea to pair it with Going Gonzo!